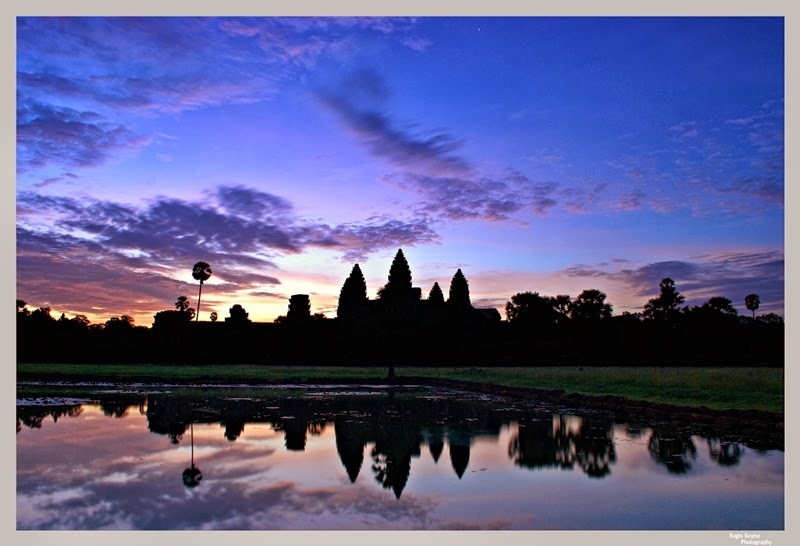 One of the most famous sunrises in the world, is the sunrise over Angor Wat. A Hindu temple in Siem Reap, Cambodia which was built in 1112 AD by King Suyavarman II of the Khmer Empire. The most powerful empire in Southeast Asia during the 9th century. Many people actually wanted to witness this sunrise, as it is so stunning and a breathtaking experience. Many postcards being sold in Siem Reap, regarding Angkor Wat, depicts the sunrise. Paintings of the famous temples being sold in the market also portray the marvelous sunrise. It is so famous that, according to blogs that I've read, thousands of tourists flock early in the morning, in Angkor Wat, with all their tripods, cameras, video cams, just to witness the sunrise. One of my friends and colleague, who is a chain smoker, was told by a doctor that his health is deteriorating and if he won't quit smoking, he will soon past away. Hearing this, one of the first things that came into his mind is " I haven't seen the sunrise over Angkor Wat yet". That's how interesting it is. Upon knowing this, I immediately thought about it. I've been to Angkor Wat, yes, but I haven't witnessed the sunrise over it. The last time we went there, we arrived at the temple at around 8:00am already. We had no plans of witnessing the sunrise then as we were too lazy to get up early. But because of my friend's wish, which is to see the sunrise over Angkor Wat before he dies, I was motivated to see it and capture it for others to enjoy. The Angkor was built facing the west. So upon the sunrise, the sun will slowly show itself behind the 5 main towers of the temple. There is also a moat in front of the temple which its reflection adds to the beauty of the scene. During summer months, March-April, the sun will rise at the center of the temple, slowly showing itself between the towers, and that what makes it so picture perfect. So I went to Angkor Wat one weekend in June 2012 to capture and witness the marvelous and famous sunrise. The night before my palnned day of going there, I informed my guesthouse ahead of time that I'll go there in the morning, to witness the sunrise. People in Cambodia know that most tourists really go to Angkor Wat to witness the sunrise so they are used to this. I told them that my friends and I will be leaving at 4:00am. I have read in the net that if you arrive there quite late, there will be thousands of people already waiting for the sunrise with all their tripods and everything. So if you want a good spot, or a good composition, go there early. As our remorque-moto(tuktuk) sped on a chilly 4 o'clock morning, I am so confident that I'll be one of the first persons to arrive there. But we didn't have tickets yet, so naturally our driver led us to the ticket booth, approximately 1-3km. before Angkor Wat. But to my surpirse, the ticket booth is still close. I desperately wanted to have a ticket so that we can now proceed to the site and setup my tripod. But the poster outside the booth says the booth will open at 5:00 am and closes at 5:30pm. So I have to wait til 5am to be able to get a ticket. We were actually the first ones who got there-but because we don't have a ticket yet, we still have to wait til 5am. Slowly some people arrived and waited for the booth to open too. Some already have tickets so they went straight to Angkor Wat. I was quite worried as I saw tuktuks, bicycles, buses, cars get past us as they head straight to Angkor Wat while we were still outside the booth waiting for it to open. They have tickets already. Either they bought it yesterday or they have multiple days ticket. So if you want to be really early in Angkor Wat, buy a ticket the day before. As the booth will open at 5:30am. Finally the booth opened and we had our tickets. I paid $20. That's good for a day. While some of my friends got a 3-day ticket worth $40. We head straight to the temple. We arrived at the temple when it was still dark. You need a flashlight in order to find your way. Good thing one of my friends had one. As I approach the moat in front of the main temple in which I plan to setup my tripod, I was approached by a local. He said he has some mats prepared for us as we wait for the sunrise. Many locals do this because they have a restaurant inside the temple and they serve breakfast and drinks for the people who wants to witness the sunrise at the break of dawn. This is a great idea as you don't need to go back to your hotel or guesthouse. You can just order anytime. And by providing mats for people to sit on while waiting for the sun, they will also hand to you the menu. I ask him where is the perfect spot to set my tripod, he told me "I've been here for 20 yrs., would you believe me if I say this is the perfect place?" Pointing to one spot with a mat. of course I immediately believed him. I set up my camera putting on my semi-wide angle lens and did some long exposures. And he told us his name is James Bond 007. Because his restaurant's number is 007. And invited us to order drinks from him and eat at his restaurant later. Slowly but surely, may people started arriving. Just as what the internet have said, it's really a lot! And to think we came in June and it is low season, but for me, it is still a large crowd. Many people flocked. Sitting on mats, chairs, standing with different cameras waiting for the sun. It's my first time to witness a large crowd like that gathered together just for the sole purpose of capturing and beholding the sun! It was so amazing! It is one of the experiences that I will never forget. It is like a large group of sun worshipers!! As the sun slowly revealed itself, you can hear thousand clicks from different cameras. All kinds of camera, all kinds of photographers, many nationalities, different races, witnessing the majestic sun over a majestic temple. It was so beautiful. Angkor Wat was like a supermodel being photograph by tons of photographers and paparazzi during that time. It was really a beautiful show. The wonderful power of God, His marvelous creation revealed over a wonderful creation of man. A stunning work of geniuses. It was a wonderful sight to behold. Many clicks,many wows, can be heard. Some didn't bring a camera but just sat there and savored the moment. What a marvelous experience. To experience God's greatness and His creations' ingenuity through Angkor Wat is a breathtaking and memorable experience. Thank you God for giving us this wonderful show. After clicking tons of shots. long exposures, f8's and f16's and as the sun became higher, we had a few portrait to have a remembrance of that experience and headed to the restaurant of James Bond 007 for our breakfast. Our rice coffee, hot chocolate plus a typical Khmer breakfast is waiting. Jame Bond 007's restaurant. Time to fuel for the day's temple tour. Meet James Bond. Our local assistant during the sunrise shoot and the owner of the restaurant. That moment will never be forgotten. A marvelous moment, a great experience shared with friends. Visit Angkor Wat too, and witness the sunrise as I assure you, you will have a meaningful and unforgettable experience as well. Where was your memorable sunrise experience? Share it to us. P.S. In December, the sun rises between the "lotus" pillars of the temple which is more spectacular. We were here in June. It was indeed magical, got the chance to see it as well last february, and the food you ordered looks like the one I had too LOL! Thanks do. Oo do. Sobrang bait non. Makwento pa. Madami tayong matutunan tungkol sa history. Survivor siya ng Khmer Rouge war. awesome photos of the sunrise! now i wished i've done that sunrise thing din. like you before tinamad din kami magising ng maaga. hehehe. what lens did you use pala? Calvin, you are the reason why I went to Angkor Wat last year and why I started blogging. I was inspired by your blog. Because of your post, I also did a Vietnam, Cambodia overland. But I started in Bangkok. Thank you so much. I just used my kit lens, the 18-55mm 3.5-5.6.
nice! good plan on the Bangkok thing. That was our mistake. hehehe. Oh well, at least we can visit Bangkok some other time. Cheers! Thanks Calvin. Message me if ever you'll be visiting Bangkok.